Dramatic results for mind, body and spirit. The benefits of Taekwondo have never been so relevant or important in today’s fast-paced world. Achieve what you never thought was possible! Pacific Sun Taekwondo makes exercise and fitness enjoyable and exciting for people of all ages and abilities. It improves co-ordination, balance, stamina and muscle strength – a full body work out in a personalised, friendly environment without aggression or crowds. Training with Pacific Sun Taekwondo will not only help you get fit and enable you to defend yourself, it will also provide a dramatically positive impact on many aspects of your life. Importantly, it presents an opportunity to take time out to focus on a new challenge. Most people lead busy lives and are short of time. Often the first thing they cut out is their exercise program as they see it as personal recreation. It may be enjoyable but exercise is also essential for our mental well-being. It keeps us sane and balanced. Martial arts training in a safe environment with its satisfying punching and kicking skills is a fantastic way to reduce stress after a demanding day. If you have been looking for something new to break out of your regular routine and reinvigorate your life, then look no further. Get fit, de-stress, develop new skills, boost your confidence, increase your mental focus and improve your life balance. Pacific Sun Taekwondo will enhance your ability to cope with the fast pace of modern life in many ways and empower you to embrace a ‘go for it’ attitude across all areas of your life. The friendly yet disciplined training sessions at Pacific Sun Taekwondo will give you the support and encouragement you need to reach your full potential and enjoy a fitter, healthier and happier future. To discover your nearest branch click here. 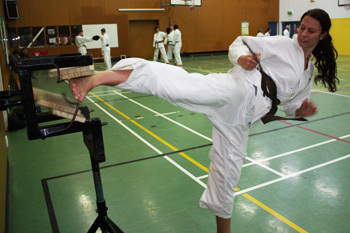 Taekwondo is a non-contact martial art from Korea. Translated, it literally means ‘the way of hand and foot’. It is an artistic discipline, a self-defence system, a fun fitness activity and, most importantly, a way of life. The Art is well known for its powerful and exciting kicking and punching techniques, which include fast hand and foot combinations, spectacular jumping and flying kicks and powerful blocks and strikes, all executed with skill and control. The physical training component of Taekwondo develops strength, speed, flexibility, faster reflexes, improved co-ordination and the ability to protect oneself from attack. Regular training makes you fitter, stronger and more flexible and provides a tremendous sense of achievement and satisfaction. But there is so much more to Taekwondo than the purely physical side. The philosophy of Taekwondo emphasises moral, emotional and physical development, with the aim of building a better and more peaceful world. That philosophy, together with the values and traditions of martial arts training, gives students a moral code of conduct to follow. It is this code of conduct that separates Taekwondo from other forms of exercise. It is best summed up by it’s five tenets. When Taekwondo training incorporates these values and traditional rules of behaviour, the practitioner learns self control and gains an inner strength that develops character, integrity and self confidence. It is this holistic development of body, mind and spirit that truly sets Taekwondo apart and empowers the practitioner to enjoy endless benefits across all aspects of life.